Sadly, we are nearing the point that few living actually have firsthand accounts of this building before it burned and was bulldozed. Even if you are too young to remember doesn’t mean you should forget. Read on. This place was unique, beloved, beautiful, and well utilized. Founded as a place for ALL to gather — irrespective of race, gender, faith or other beliefs — it was one of the city’s most significant meeting sites. In April 1871, an agreement was reached between Mrs. Tomlinson and the City, which was to become legal owner of the property on condition of paying Mrs. Tomlinson an annuity of $7,000 per annum, as long as she should live. Construction of the building began in 1885, completed in the spring of 1886, designed by Dietrich Bohlen, contractor, George W. Stanley. 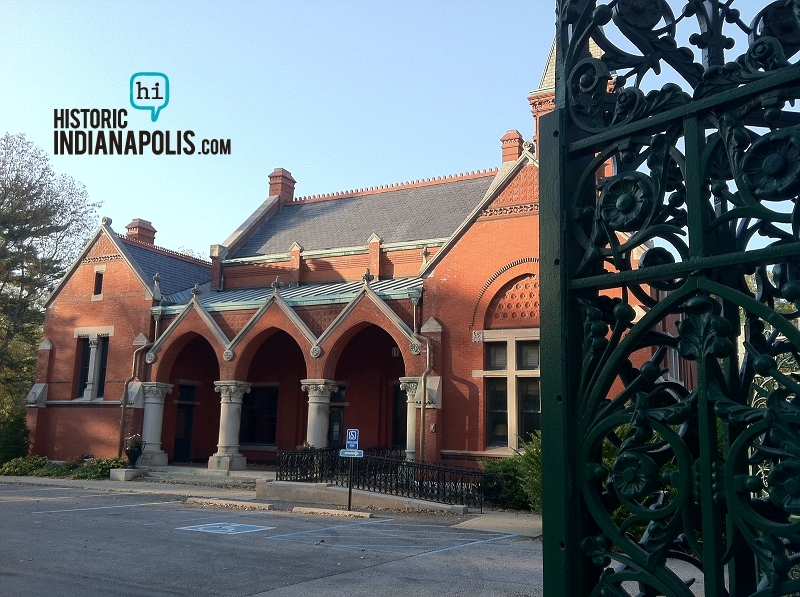 Bohlen also designed City Market, Roberts Park Methodist Episcopal Church and headquarters for the Morris-Butler House. 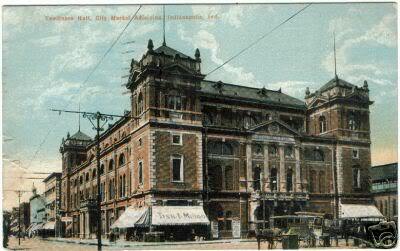 The dedication of the building took place on June 1, 1886, and was managed by the Grand Army and the festival featured a veteran actor of the time, James M. Murdock, who recited “Sheridan’s Ride,” “…as no other person ever did,” the newspaper was quoted as saying. The musical program included Lilli Lehman as principal soloist and Mrs. J. F. Frenzel, Mrs. H. Schurmann, Mrs. U.J. Hammond and other local artists of the day. The seating capacity was 3,500, and the cost of the building including all its plumbing, heating, and infrastructure, was estimated at $137,500. 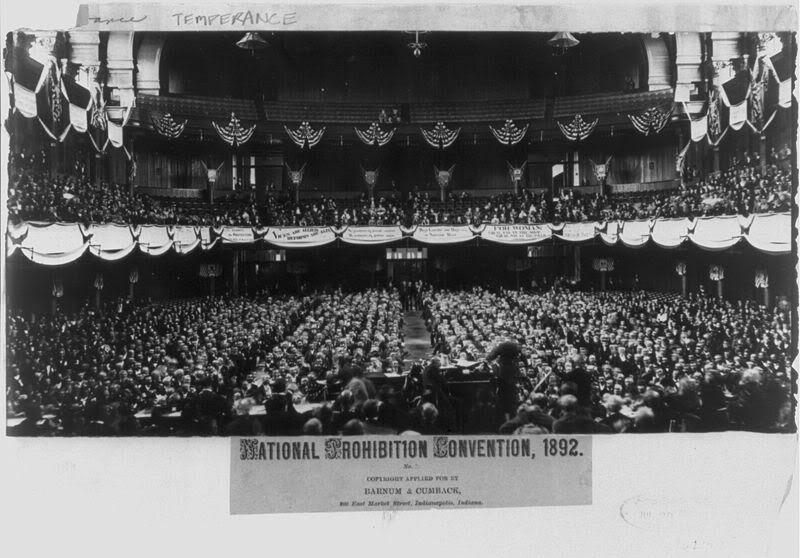 The orchestra for the evening’s inauguration was drawn from musicians of both Indianapolis and Cincinnati and counted among them, “eight violins, eight second violins, six violas, six violincellos, six contrabasses, two flutes, two oboes, two clarionettes, two bassoons, four horns, two cornets, three trobones, one tuba and the drums”–numbering 55 in all. The director was Carl Barus. The first piece of music to be played in the building was Rossini’s overture to “Semiramide,” followed by Rhigini’s “The Lord is Great,” then “Stabat Mater ,” by Pergolesi and then back to Rossini for “Inflammatus .” After a 30 minute intermission, the music continued with Rossini again, with the overture to “William Tell ,” “Hear My Prayer,” by Mendelsson and “Tannhauser- Grand March,” by Wagner. 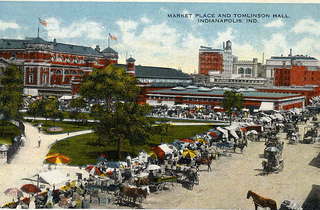 Well known people of the day came to Indianapolis for the celebration, including a General John A. Logan (some credit him with being the founder of Memorial Day). 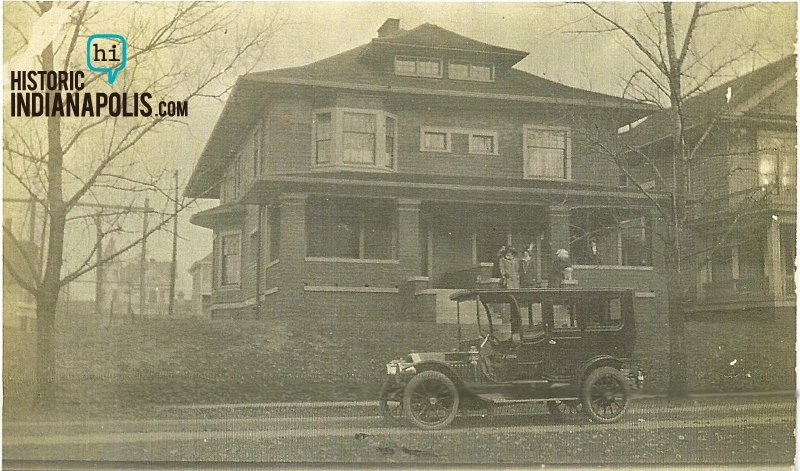 Then a Senator, Benjamin Harrison met him at the depot, as Logan was to be a guest at the Harrison Home whilst in town overnight before the two gentlemen were to return to Washington, D.C.
A total of 22 pieces of firefighting equipment were counted on the scene, including six aerial trucks fighting the 4-alarm blaze that swept through Tomlinson Hall on January 30, 1958. The first alarm sounded at 10:06 pm. 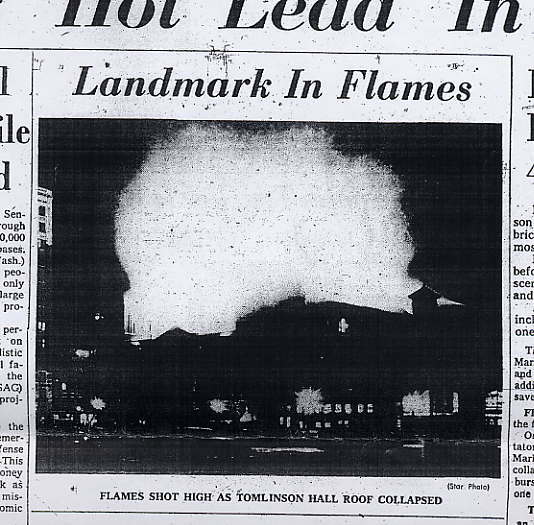 “Tons of water poured on the fire flowed out into Market Street, turning it into an icy lake.” On Tuesday, July 8, 1958, after much public outcry and attempts to keep the building from being razed, the wrecking ball was on the scene to destroy what was left, removing forever a beloved gathering place for all. Who hasn’t pondered the arch that stands just west of the City Market, the last vestige of Tomlinson Hall, and exactly where it stood, and to whom this served as entryway to an evening’s entertainment, fellowship, celebration, or memorable occasion. How lucky we are that City Market remains. Next time you are in the little plaza on the northeast corner of Delaware and Market Streets, perhaps you can drum up a ghost from the past reciting that first evening’s reading of Sheridan’s Ride, (provided herewith) or download one of the pieces of music played and take your ipod and listen to the piece where you know it played over 124 years ago. What was to be done? what to do?–a glance told him both. NextWTH Weds: After the fire? Thank you so much. I love reading and hearing about Indianapolis history. I just reread your 2010 article about Tomlinson Hall and noticed some things that went right over my head when I read it the first time. One of the pieces of music played at the dedication of the building in 1886 was Gioachino Rossini’s “Inflammatus.” That Latin word translates to “aflame” or “burning” in English! Apparently, the musical selection on opening night was a sign of the building’s eventual demise more than 72 years later. 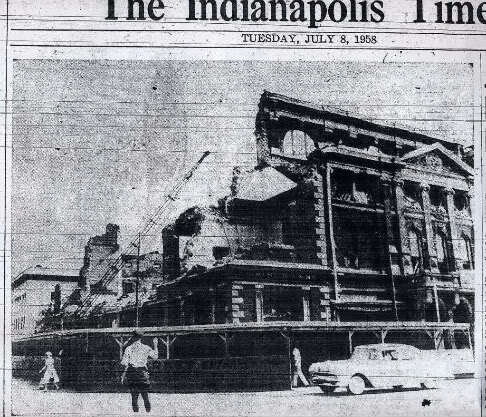 Somewhat coincidentally, not long after Tomlinson Hall burned down, the Shortridge High School A Cappella Choir (of which several people in my family were members over the years) performed Rossini’s “Stabat Mater” (the work from which the piece “Inflammatus” comes). Our concerts were accompanied by the Indianapolis Symphony Orchestra. Another interesting note is that Carl Barus, the musician who conducted the opening night concert, was the maternal grandfather of Edith Sophia Lieber Vonnegut. Edith was the wife of Kurt Vonnegut, Sr. and the mother of Kurt Vonnegut, Jr. The younger Kurt’s daughter, artist Edith “Edie” Vonnegut Squibb, is named for her grandmother. Thank You. I work for the Indiana Historical Society and we are training for our next ” You are There” (where people can walk in to a photograph from Indiana’s past. The photo is of a flood relief station in West Indianapolis. We were told that the main relief station was at Tomlinson Hall. This helps a great deal!